Today when I visited bet24.com (Swedish site) I happened to notice something really strange in the upper left corner. There was an button looking like the “power on” icon with the label “Switch off”. Image 1. Bet24.com’s “Switch off” button. My first thought was “Hmmm to I turn off bet24.com here??? ?” Of course I couldn’t do that, instead it is connected to the top banner “Robin Hood – Shifting Riches” which is a new game from Net Entertainment. Image 2. 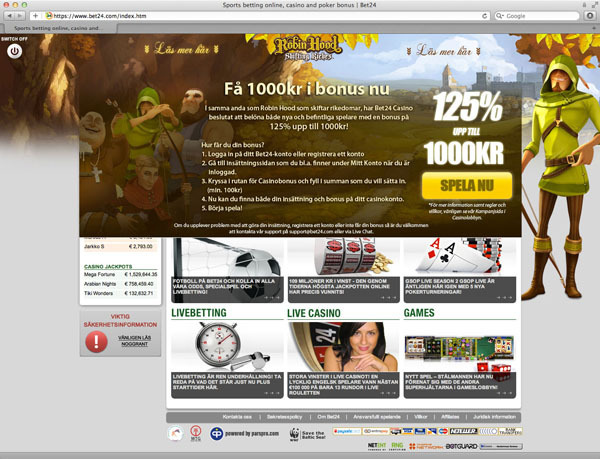 Bet24.com’s start page (Swedish). When you move your mouse over the top banner then it expands and shows more information about the game, see image 3. Image 3. Bet24.com’s start page when player moves mouse over the top area. So what does the “Switch off” means? When you click on the “Switch off” then nothing will happen when the player moves the mouse over the top area. Nothing will happen when the player clicks on the link “Read more here” in the top area either. I think Bet24 has added a really strange function to their page. Why not just make the “Read more here” links into real links that the player can click on to get the more detailed information in image 3!